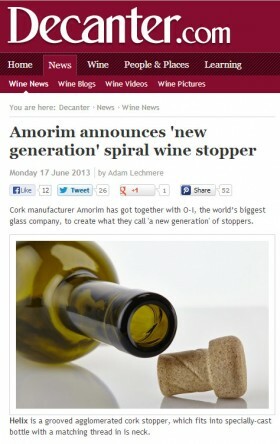 Cork manufacturer Amorim has got together with O-I, the world’s biggest glass company, to create what they call 'a new generation' of stoppers. The system, is aimed at the £5-£10 market, has taken four years to come to market. It has been tested successfully with consumers in France, US, China and the UK. Bottles fitted with the closure have also been tested for the strength of the cork stopper, its sealing capacity and the effect on the wine during ageing. ‘Helix combines all the benefits of cork and glass – quality, sustainability and premium image with user-friendly, re-sealable convenience. It can be quickly and easily implemented by wineries with only a minor adjustment to the existing filling lines,’ a press release said.